This magnificent orchid grows in very wet meadows, and so wellington boots are a big advantage if you are intending to take photographs. The specimen shown below was found in Bulgaria in late June. Dactylorhiza elata can grow to well over a metre in height. The narrow leaves at the base of the plant are usually unspotted, although lightly marked specimens do sometimes occur. The inflorescence is lax and carries up to 120 individual flowers, which vary in colour from pale to dark pink. The markings on the petals and sepals are extremely variable in shape and number; some flowers are covered with loops and spots while others have very few. 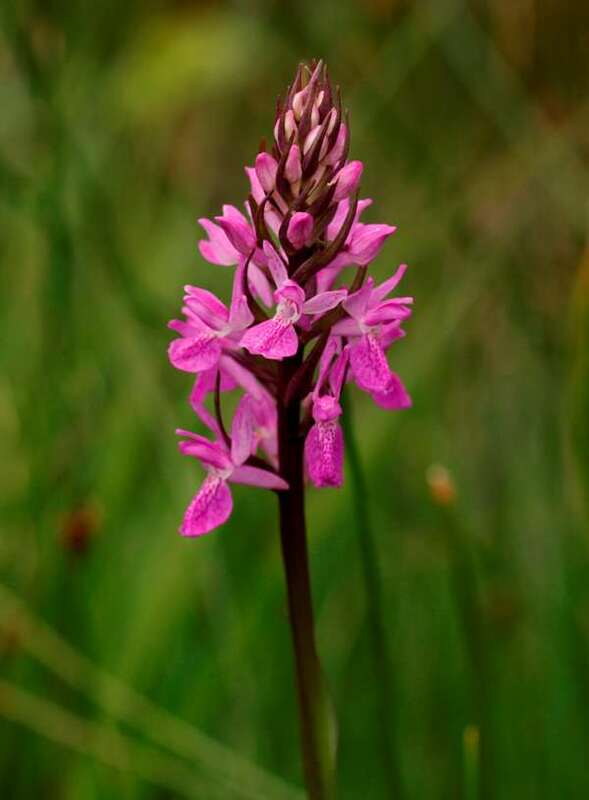 The Robust Marsh-orchid occurs in the western Mediterranean region - Spain, Portugal and France as well as in some of the countries of central Europe including Bulgaria. Most commonly found in damp-to-wet alkaline meadows and fens in full sunshine, Dactylorhiza elata also occurs in seepages on roadside banks and verges. This orchid can be seen in flower from April until July, and much depends on not only how far south they occur but also at what altitude. In lowland parts of southern France the plants can flower in May, but even further south, in northern Spain for instance, the plants flower much later because they mainly occur at high altitudes. Sometimes referred to as Dactylorhiza elata subsp. 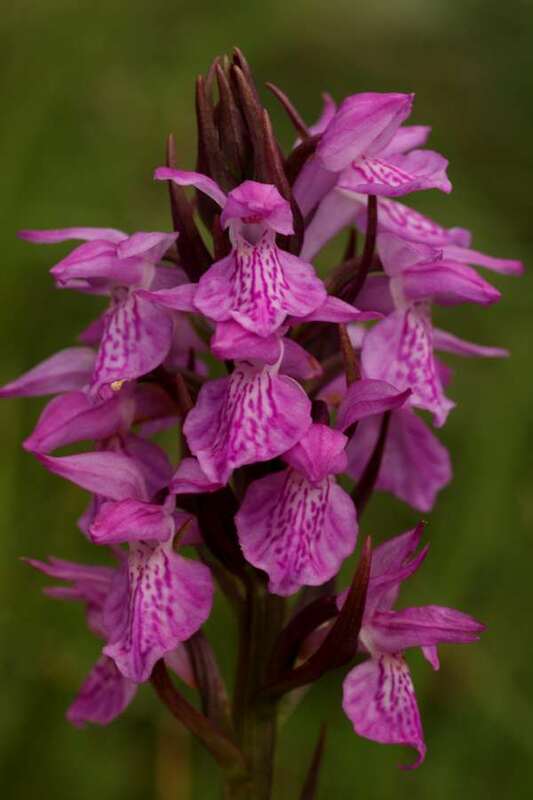 brennensis or as Dactylorhiza brennensis, this variety of the Robust Marsh-orchid is found in central France in Brenne. The plants are not only shorter but also rather more spindly in appearance than thos of Dactylorrhiza elata. 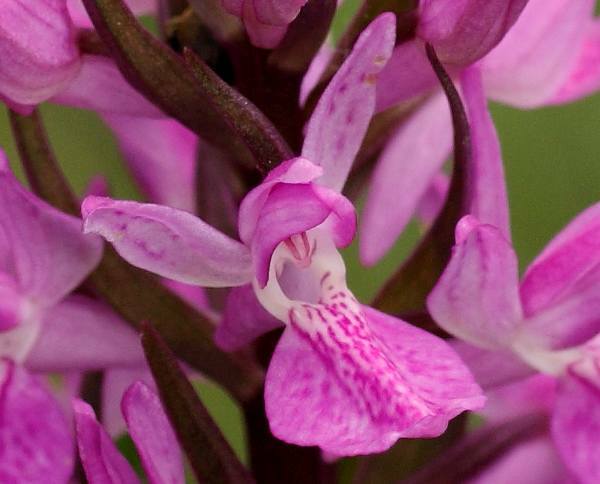 The flowers are also slightly smaller than those of Dactylorhiza elata. Dactylorhiza elata subsp. brennensisgrows in the same habitats as Dactylorhiza elata.